What should you know about gastritis? Can you drink alcohol and eat any foods with gastritis? What foods relieve gastritis symptoms? How do you know if you have gastritis? What OTC and prescription medications treat gastritis? What home remedies relieve symptoms of gastritis? Is there a special diet for gastritis? Can you die from gastritis? What is the medical definition of gastritis? Gastritis is inflammation of the stomach lining. There are two types of gastritis, acute and chronic. Some people with gastritis may not have any symptoms; however, both acute and chronic gastritis may have symptoms and signs of abdominal pain, nausea, vomiting, and occasionally, belching, bloating, loss of appetite and indigestion. A bacterium called Helicobacter pylori or H. pylori, and nonsteroidal anti-inflammatory drugs (NSAIDs) are the two main causes of gastritis; however, there are many other causes of the condition, for example, infectious agents, autoimmune problems, diseases like Crohn's disease, sarcoidosis, and isolated granulomatosis gastritis. Gastritis can be diagnosed by the your symptoms and history (for example, NSAID and/or alcohol consumption), or by breath, blood, stool, immunological, and biopsy tests to detect H. pylori, and other tests like endoscopy or radiologic studies demonstrate mucosal changes. The treatment for gastritis varies according to the cause. Other less common causes may be treated similarly, but do not treat the underlying cause. Is there a diet for gastritis? Gastritis symptoms can be aggravated by chemical irritants that cause or aggravate the symptoms of gastritis should be reduced or stopped all together. For example, stop smoking cigarettes, avoid drinking excessive amounts of alcohol, avoid caffeinated, decaffeinated, and carbonated drinks; and fruit juices that contain citric acid, for example, grapefruit, orange, pineapple, etc., and avoid high-fat foods. There is no gastritis diet, however, the growth of H. pylori may be stopped by a diet rich in fiber, and foods that contain flavonoids, for example, certain teas, onions, garlic, berries, celery, kale, broccoli, parsley, thyme, foods with soy, and legumes, for example, lentils, kidney, black, soy, pinto, and navy beans. What home remedies help reduce symptoms of gastritis? Home remedies may help reduce gastritis symptoms, but usually does not treat the underlying cause of the condition. How long does it take for gastritis to go away? People with acute gastritis usually recover completely with no complications. However, chronic gastritis may have a range of outcomes from good (early treatment) to poor if serious complications develop. Rarely, complications can occur from acute gastritis. Complications from chronic gastritis include peptic ulcer, bleeding ulcers, anemia, gastric cancers, MALT lymphoma, renal problems, strictures, bowel obstruction, or even death. If underlying causes of gastritis (for example, alcohol, or NSAIDs usage) are treated or not used, gastritis also may be prevented. Gastritis may be cured if the underlying cause(s) is cured. How can you prevent gastritis? Since gastritis is infections and can you can avoid it by practicing good hand washing techniques, for example, wash the hands thoroughly and frequently. To reduce the risk of gastritis avoid situations where you are exposed to chemicals, radiation, or toxins. Gastritis is inflammation of the lining of the stomach. Unfortunately, the term "gastritis" has been misused to include many different upper abdominal problems, but true gastritis refers to the stomach lining (gastric mucosa) that is inflamed. 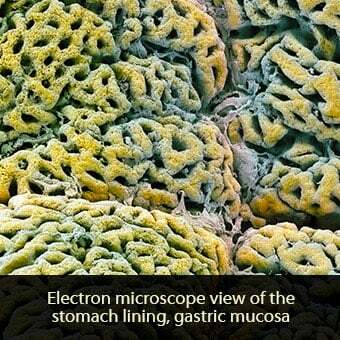 All or part of the gastric mucosa may be involved. Gastritis may be classified as acute or chronic. Acute gastritis maybe characterized as erosive (damaged areas where mucosal cells are disrupted or missing) and nonerosive. Chronic gastritis is determined by histopathology (appearance of the gastric mucosa) with symptoms lasting a long time. There is no widely accepted classification system although some have been proposed. This information will focus on true gastritis. Gastritis has many causes, but most causes result in similar symptoms. This has leads to some confusion and is the reason why many health-care professionals now consider the term "gastritis" as a non-specific description of a cluster of symptoms. Acute gastritis lasts for about 2-10 days. If chronic gastritis is not treated, it may last from weeks to years. Many people with gastritis do not have symptoms. The condition is diagnosed only when samples of the stomach mucosa are examined for other suspected diseases. However, when gastritis symptoms occur, the most common symptoms include abdominal pain (intermittent or constant burning, gripping or gnawing pain), nausea and vomiting, diarrhea, loss of appetite, bloating, burping, and belching. Foods and other substances that should be avoided to reduce or prevent gastritis symptoms include, alcohol, spicy, fatty, and fried foods. Moreover, anything that might be toxic or irritating to the stomach should also be avoided (for example cigarette smoking, acidic drinks like coffee, garlic powder, chili powder, peppers and tomato products). The University of Maryland health-care professionals and others suggest that eating smaller, more frequent meals and avoiding foods that are spicy, acidic, fried or fatty will help reduce symptoms. Moreover, stress reduction is also recommended. Dietary changes such as ginger tea and/or chamomile tea with honey reportedly soothes gastritis symptoms while onions, garlic, cranberries, apples, and celery may stop H. pylori growth. Although these home remedies may help reduce or soothe symptoms, home remedies seldom treat the underlying causes of gastritis. 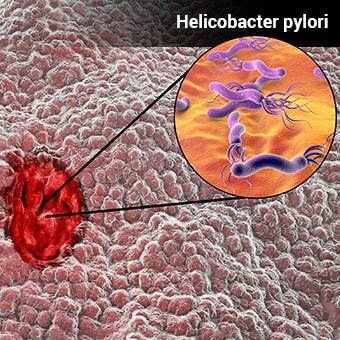 A major cause of both acute and chronic gastritis is infection of the stomach mucosa by a bacterial species named Helicobacter pylori. Usually, this bacterium first infects the stomach antrum (stomach mucosa without acid-producing cells) acutely and may progress to infect most or all of the stomach's mucosa over time (chronic gastritis) and remain there for years. This infection generates an initial strong inflammatory response and eventually, a long-term chronic inflammation with intestinal cell changes may develop. Another major cause of acute and chronic gastritis is the use (and overuse) of nonsteroidal anti-inflammatory drugs (NSAIDs). In general, infectious agents, especially Helicobacter pylori, and NSAIDs are responsible for the majority of people with gastritis. 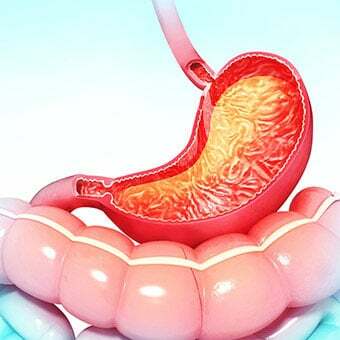 Gastritis is diagnosed based on the patient's symptoms and history of a previous diagnosis and treatment of gastritis, alcohol consumption, and use of NSAIDs. Definitive diagnosis of gastritis is made by identifying the underlying cause of the gastric mucosal inflammation and/or by tissue (gastric) biopsy. For example, the major infective cause of gastritis is Helicobacter pylori (H. pylori). This bacterium can be detected by breath, blood, stool, immunological and biopsy tests. Although the bacterium can be cultured from the patient, this is seldom attempted. Other pathogens can be identified using culture, stool, and immunological tests. 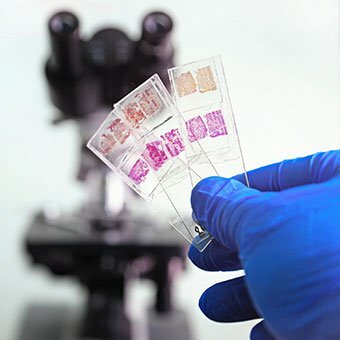 Biopsy of the stomach mucosa, done during endoscopy examinations, is often used in patients to identify the causes of chronic gastritis and may allow visualization of mucosal erosions and other stomach mucosal changes. Abdominal X-rays or barium studies (upper or lower) may demonstrate the presence of thickened mucosa and folds that are signs of inflammation in the stomach. Your doctor can help determine which tests should be done, including ancillary tests that may help identify other causes of the non-specific symptoms commonly found with gastritis. Treating the underlying cause of gastritis is the most effective way to reduce or resolve gastritis symptoms. For example, if the cause of gastritis is H. pylori, then treatment with appropriate antibiotics (usually a combination of amoxicillin and clarithromycin [Biaxin, Biaxin XL] plus bismuth subsalicylate [Pepto-Bismol]) should be effective to provide relief from symptoms. If NSAIDs are the cause, then stopping the drug should be effective. PPI's or proton pump inhibitors (omeprazole [Prilosec], pantoprazole [Protonix], esomeprazole [Nexium]). They all function by different mechanisms to reduce acid in the stomach but usually do not treat the underlying cause of gastritis. Treatments for gastritis vary and depend on successful treatments of its underlying cause(s). 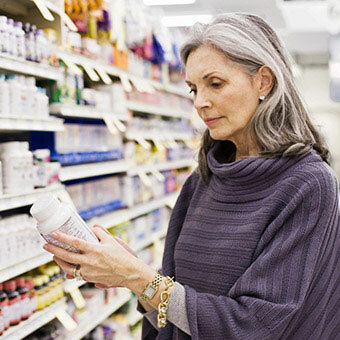 The most common treatments are over-the-counter (OTC) and prescription medications for symptom relief. A diet that avoids hot, fried and/or spicy foods, alcohol drinking, or eating items you may be allergic to is another good way to both treat and reduce the risk of gastritis. Usually, home remedies do not treat the underlying cause of gastritis. There are general recommendations about what foods and drinks that you should consume to help reduce and relieve symptoms of gastritis. If underlying causes are not treated (for example, severe H. pylori infection, eating spicy foods and/or alcohol consumption), diet changes may result in little or no change in gastritis symptoms. Most people that get gastritis have few or short-term symptoms, and recover completely and are cured of the condition. Those people with underlying causes that are appropriately treated often recover completely. The prognosis of individuals with chronic disease and those who develop serious complications like bleeding ulcers, obstruction, and cancer . The complications of gastritis may occur over time, especially if gastritis becomes chronic and the underlying causes are not treated. Complications of gastritis may include, peptic ulcer, bleeding ulcers, erosive stomach lining (the stomach tissue wears away), anemia, gastric cancers, MALT lymphoma, gastric scarring and strictures with outlet obstruction, dehydration, kidney problems, and death. If the underlying cause of gastritis is preventable, then gastritis can be prevented and people can get gastritis relief. Don't drink alcohol, take NSAIDs, and quit smoking if they trigger gastritis. Avoid situations where chemicals, radiation or some toxin ingestion could be. It may be more difficult to prevent some infectious causes of gastritis, but proper hygiene, hand washing, and eating and drinking only adequately cleaned or treated foods and fluids are healthy ways to decrease your risk of getting gastritis from infectious agents. Marcus, A, MD, et al. Chronic Gastritis. Medscape. Updated: Dec 20, 2017. Oregon State University, Linus Puling Pauling Institute, Micronutrient Information Center. "Flavonoids." Updated: Feb 2016. Wehbi, M. MD. "Acute Gastritis." Medscape. Oct 12, 2017.